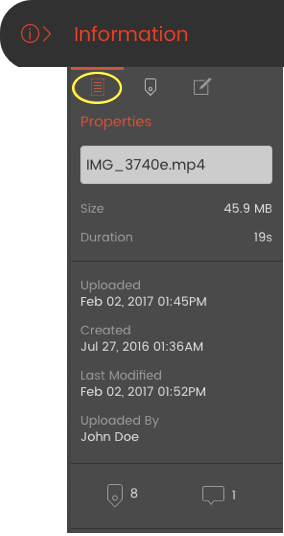 All project files are displayed as thumbnails. Thumbnails show basic file properties, as well as the number of tags currently on the file. Click on a file's thumbnail to open it in the media reviewer. File thumbnails can be grouped and sorted. The default grouping order is by Created (Newest); you can change that order by clicking on the group icon, and selecting one of the options available: None, Uploaded (Newest), Uploaded (Oldest), Created (Newest), Created (Oldest), Type, Member. The default sort order is by Created (Newest); you can change that order by clicking on the group icon, and selecting one of the options available: None, Uploaded (Newest), Uploaded (Oldest), Created (Newest), Created (Oldest), Type, Member, Name. Click the Browse button to select files from your computer to upload, or drag & drop individual files or folders into the pop-up window. 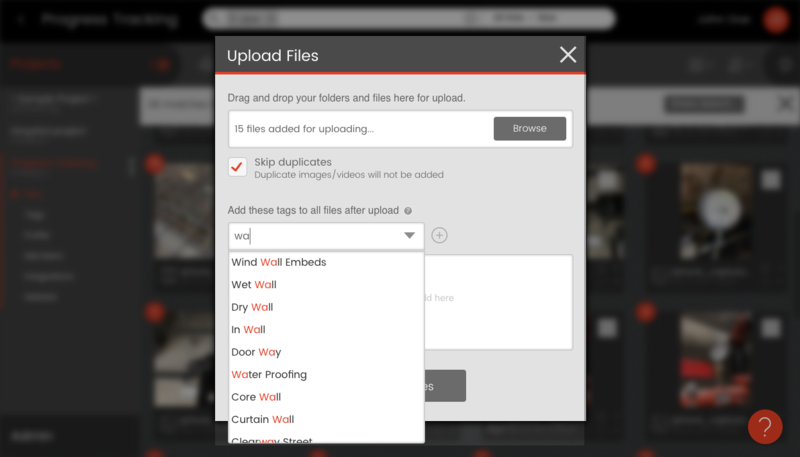 Dragging a folder will upload all of its contained image and video files (including subfolders). 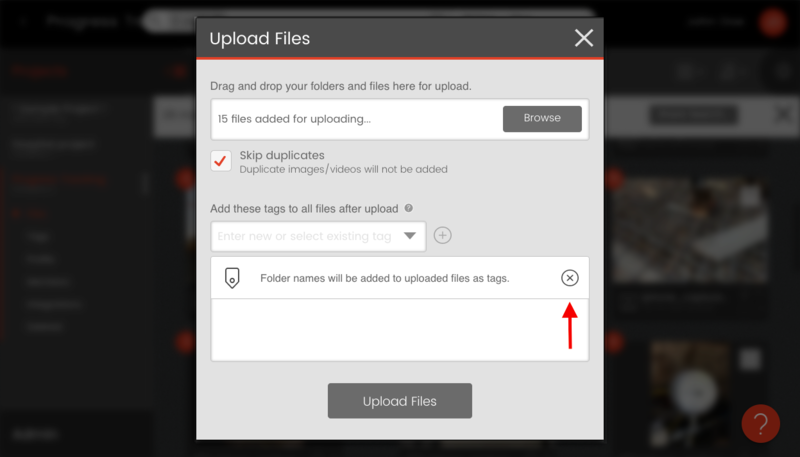 Uncheck "Skip duplicates" if you don't want to skip uploading files that match existing project files. Sending an email with a link: email someone a link to view the shared files, and optional message. Type an email address to share with. As you type, matches to emails of registered users will be auto-suggested; click on one to select it. If email you enter isn't yet registered in Smartvid.io, they will receive an invitation to join and view your files. Repeat the last 3 steps for additional people you want to share with. Under Message to send with link, type an optional message to include with the link. Click the Send button to share. Under Share With, choose if the link should be (a) only visible to project members, (b) visible to anyone in the project organization, (c) public (if your company has enabled public links). Paste the link where you want to share it (Ctrl + V on Windows machines or Command ⌘ + V on Macs). Click the Done button to close the share window. On your computer, double-click the .zip file to extract the downloaded files. Select file(s) using thumbnail checkboxes (you can also press Ctrl + A to select the first 50 files). After adding tags, click Generate. Wait for this pop-up, then click Download to download the report to your computer. Use the thumbnail checkboxes to select one or more files. The Properties tab shows the following file information. The Tags tab shows a list of tags on the file. 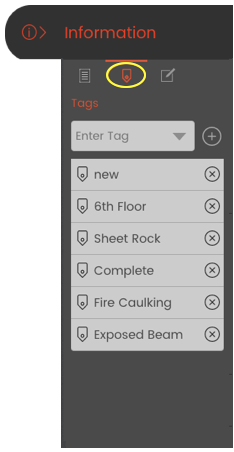 of the common tags on all the selected files. Type the tag name in the Enter Tag box. To add a new tag, type the full tag name and click +. selected, the tag will be added to all the files. Click the 'x' buttons next to a tag's name to delete it. selected, the tag will be deleted from all the files. 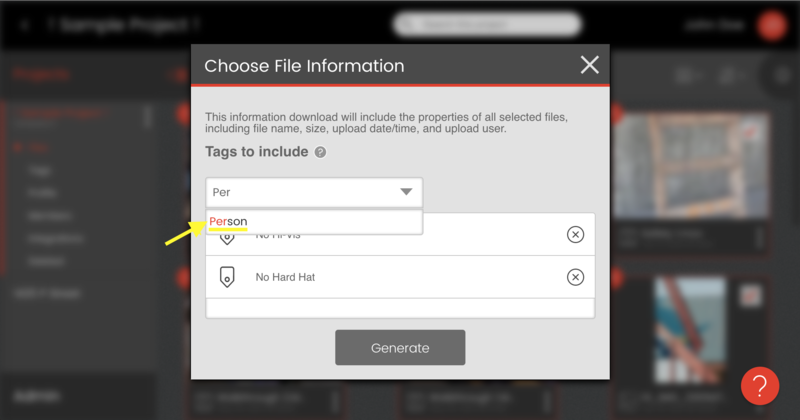 The Description tab shows the file's description. 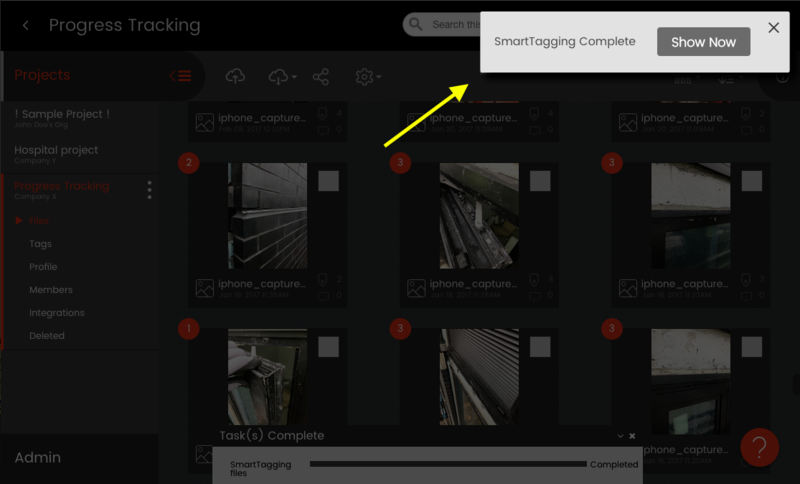 If you've added, updated or deleted tags in a project’s tag dictionary, re-run SmartTag over files to capture any instances of newly defined/edited tags. QuickTip: Use keyboard shortcut Ctrl + A on Windows or Command ⌘ + A on Macs to select all thumbnails. 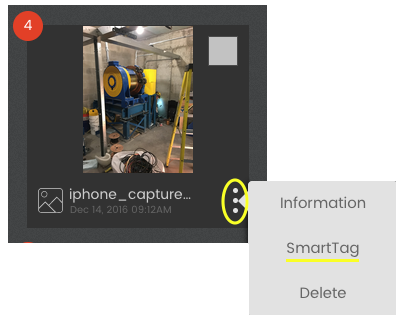 Note: This warning is to remind you that all SmartTags from the previous SmartTag run will technically be erased and replaced with all tags found in the new run. 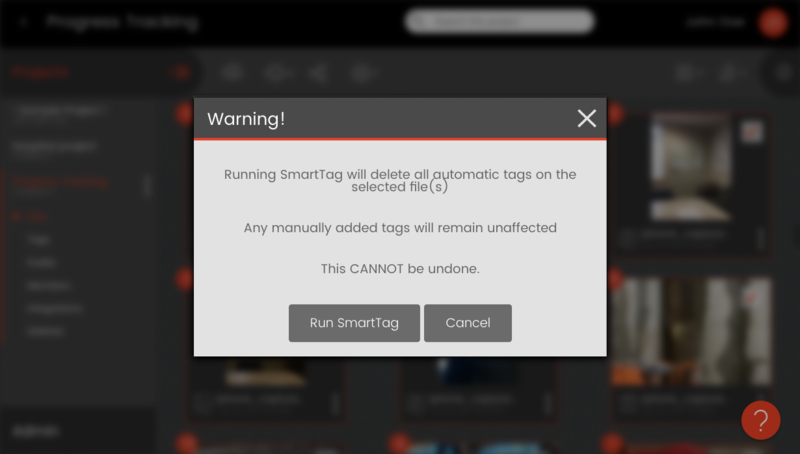 However, except for instances of new or altered tags, all former tag instances will just be re-created; the SmartTag engine will find the same instances as it did in the initial run. Also, any manual tags will not be changed. 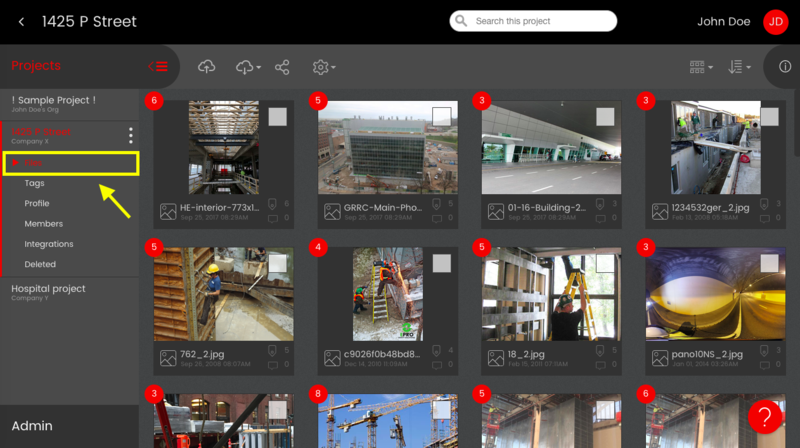 Project members with appropriate permissions can use the Files view delete project files. Use the checkboxes in the top right of file thumbnails to select file(s) to share. QuickTip: Use keyboard shortcut Ctrl + A on Windows or Command ⌘ + A on Macs to select all thumbnails on a project. Click Delete again on the pop-up warning to permanently delete. You can use the Deleted view to view, recover or permanently delete your recently removed files.